NASA said that its Kepler spacecraft has spotted "Earth's bigger, older cousin": the first nearly Earth-size planet to be found in the habitable zone of a star similar to our own. Though NASA can't say for sure whether the planet is rocky like ours or has water and air, it's the closest match yet found. 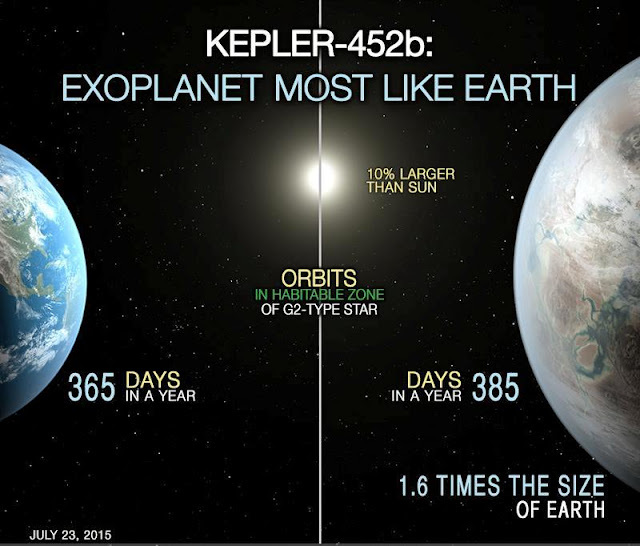 The planet, Kepler-452b, is about 1,400 light-years from Earth in the constellation Cygnus. 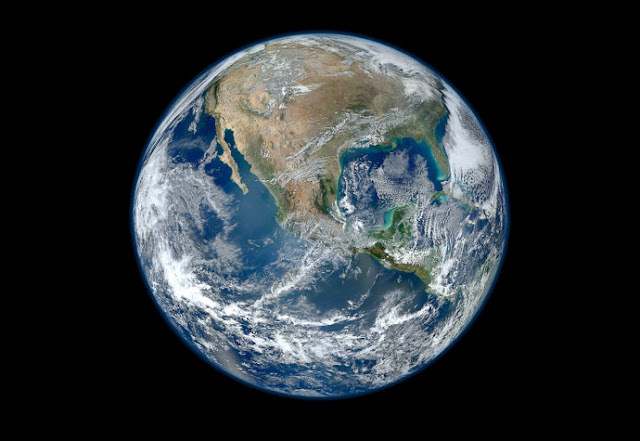 It's about 60% bigger than Earth, NASA says, and is located in its star's habitable zone -- the region where life-sustaining liquid water is possible on the surface of a planet. A visitor there would experience gravity about twice that of Earth's, and planetary scientists say the odds of it having a rocky surface are "better than even." While it's a bit farther from its star than Earth is from the sun, its star is brighter, so the planet gets about the same amount of energy from its star as Earth does from the sun. And that sunlight would be very similar to Earth's, Jenkins said. The planet "almost certainly has an atmosphere," Jenkins said, although scientists can't say what it's made of. But if the assumptions of planetary geologists are correct, he said, Kepler-452b's atmosphere would probably be thicker than Earth's, and it would have active volcanoes. It takes 385 days for the planet to orbit its star, very similar to Earth's 365-day year, NASA said. And because it's spent so long orbiting in this zone -- 6 billion years -- it's had plenty of time to brew life, Jenkins said. "That's substantial opportunity for life to arise, should all the necessary ingredients and conditions for life exist on this planet," he said in a statement. The $600 million Kepler mission launched in 2009 with a goal to survey a portion of the Milky Way for habitable planets. From a vantage point 64 million miles from Earth, it scans the light from distant stars, looking for almost imperceptible drops in a star's brightness, suggesting a planet has passed in front of it. In 2017, NASA plans to launch a planet-hunting satellite called TESS that will be able to provide scientists with more detail on the size, mass and atmospheres of planets circling distant stars. The next year, the James Webb Space Telescope will go up. That platform, NASA says, will provide astonishing insights into other worlds, including their color, seasonal differences, weather and even the potential presence of vegetation.